In my recent Ad-renaline post, I forgot to mention another overwhelmingly predominant ad this time of year. The average Joe’s fiscal year is up and it’s time to account to the government. But the average Joe needs help with his taxes. Enter the tax prep ads galore! Even the federal government has ads for their e-filing service. Everyone’s on the tax band wagon. So, when I heard a rumor that this ad was floating around on the airwaves in my town, I was skeptical because I believe the company (and the ad) is based out of a much more ghetto-tastic town. Until last night. And one more, just because it still makes me laugh, courtesy of my law school buddy, RayRay. After explaining my “munch” lyrics above, RayRay shared that as a child he thought the song warned that “Grimace is gonna get you.” You know, that giant purple blob promoting fast food to kids was kinda scary. So, what songs have you consistently mis-sung? Saturday was…well…a good ole time. 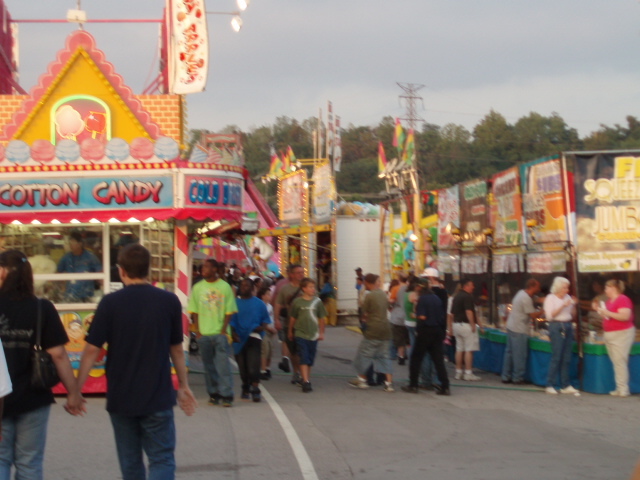 Upon entering the fair, we cruised the games, food, etc. Talk about stimulus overload! Afterwards, Bama and I went to the local pub by my house for a glass of unassuming wine. With some liquid relaxation in us, we called up some of her ‘school-friends’ we left at the fair earlier, and met the girls at the local Hustler Hollywood store for some more fun. The other girls had a great time giggling and learning. It was a great night all around!